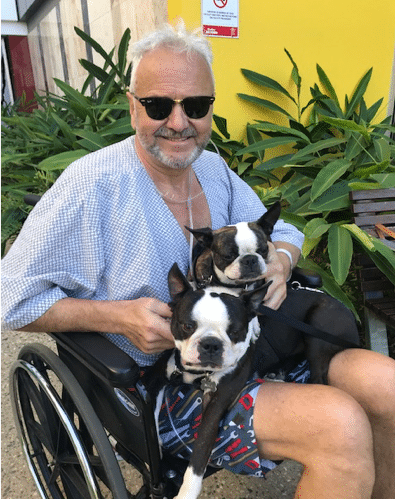 Hi my name is Wendy, and this is my story on how I became a full time Carer for my partner, Ken, who “all of a sudden” needed a Lung Transplant. Ken always carried an asthma ventilator and over winter would easily catch colds and these colds were now turning into pneumonia. About 2 years prior to the lung transplant Ken was diagnosed with low level pulmonary fibrosis which was managed by medication. He was talking about retiring and we decided we should buy a place in Port Douglas to escape the Melbourne winters. We decided to fly to Port Douglas for the weekend to look at several properties. This weekend away turned into a 3 month stay at Cairns Hospital. As usual Ken was coughing, but by Saturday afternoon he was complaining of breathlessness and the ventilator was not doing any good. We decided to book the earlier flight home on Sunday, but by Sunday morning Ken was so out of breathe we called the ambulance. He was rushed to Cairns Private Hospital. 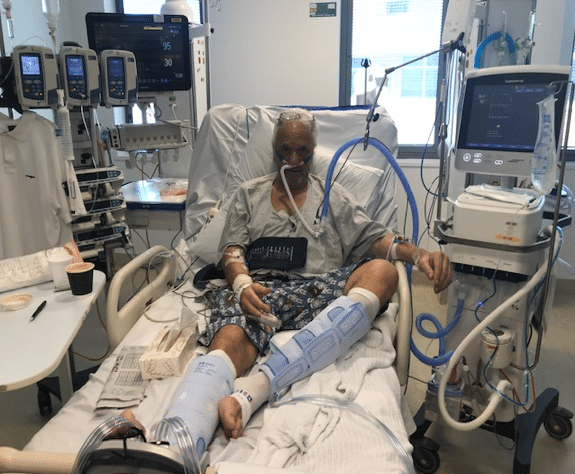 After spending one night in Cairns Private Hospital and the urgency of his situation was established, he was transferred to ICU at Cairns Public Hospital. The Doctors couldn’t determine why his immune system was attacking his lungs and advised “he probably won’t be walking out of here”. He was administered a form of “chemotherapy” to hopefully shut down his immune system. Luckily this worked, but by now his lungs were badly scarred. The prognosis was still bleak and I was advised to get his family to fly up. The biggest shock was to learn that a heart medication Ken was prescribed “Amiodarone” had a suspected known side effect of causing Lung Disease. 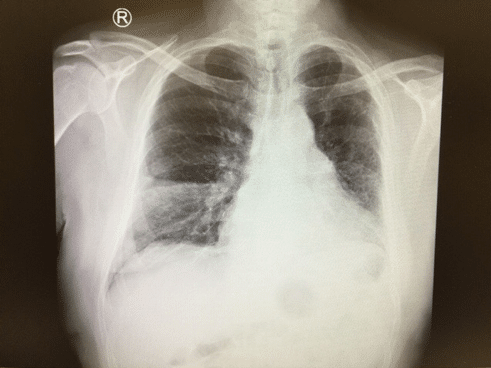 He was diagnosed with Interstitial Lung Disease (ILD) – which is when an injury to the lungs triggers an abnormal healing response. The repair process goes awry and the tissue around the air sacs becomes scarred & thickened. Whether the drug Amiodarone played a part in this we will never know, but highly likely. 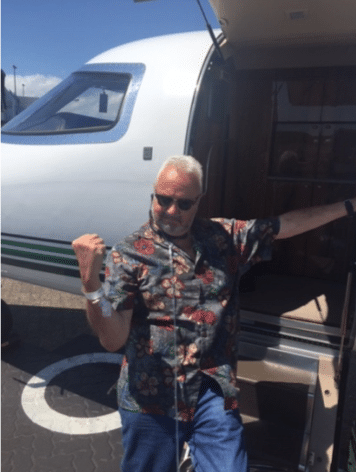 Ken did prove them wrong and walked out of hospital 3 weeks later…. but with an oxygen tank- requiring 2 litres/hour. We decided to stay in Cairns for a couple of weeks for him to convalesce before returning to Melbourne. Unfortunately he deteriorated and was readmitted to Cairns Hospital. He now required at least 4 –5 litres / hour oxygen and needed to be in a wheelchair. I had now rented a house in Trinity Beach and flown our dogs up which were a great source of pleasure to Ken whenever they visited the hospital – at least the temperature outside was always “magical” and it was very pleasant sitting in the hospital gardens overlooking the beach. Ken also managed for a while to have a room with a “million dollar view”! The next hurdle was to get him back to Melbourne. Cairns Hospital Management unfortunately reneged on their offer to fly him back and wouldn’t give approval for him to fly on a domestic flight accompanied by a Doctor. They were quite happy to have him languish in hospital for an indefinite period until they made up their mind. We had been in contact with Ken’s Lung Specialist, John Hunt, based at Footscray Hospital, and he had a bed waiting for Ken. He was confident Ken would be able to get on the Lung Transplant Programme. We decided he had to leave a.s.a.p. and Ken ended up having to organise a medivac plane himself accompanied by a Doctor and Nurse costing $54,000. Although all Ken’s medical costs were covered by Private Insurance and the Cairns Public Hospital, Ambulance Insurance didn’t cover Air Ambulance from Queensland to Victoria. Fortunately Ken passed all the “very extensive” tests required by the Alfred Hospital Lung Transplant Team and within 3 weeks of arriving back in Melbourne he was put on the list. Luckily it wasn’t too long before a lung became available and Ken had a successful single lung transplant. We are so grateful for the gift of this lung from the anonymous donor. His new lung is operating at 80% and the old lung at this stage is contributing 20%. He wasn’t able to have a double transplant because there was a problem with one of the donor’s lungs but his “super” lung as we call it is doing very well. A huge THANK YOU to all the medical staff at The Alfred Hospital Transplant Team and of course this couldn’t have happened without the anonymous Donor. We are so appreciative of this “gift for life”. We are also grateful to the Lungitude Foundation for funding research which contributed to Ken’s successful lung transplant.